← Advertising in Lebanon: TV remains n.1 and internet is inexistant! 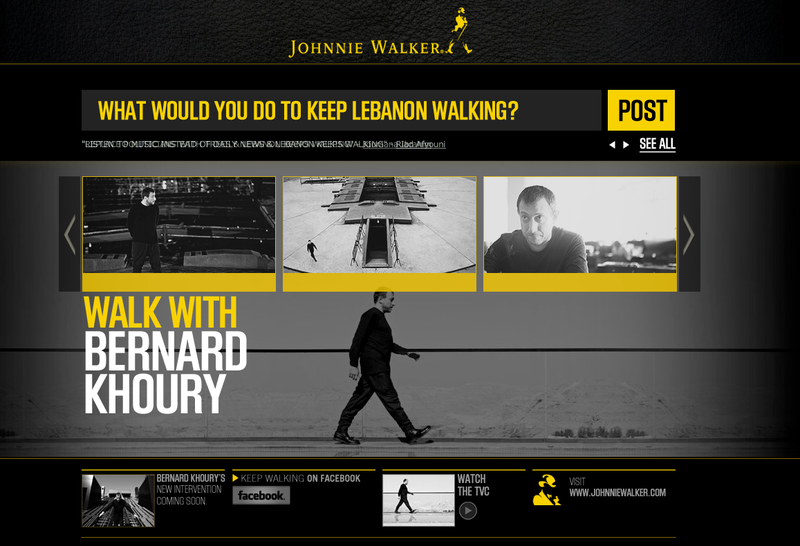 Have you seen the latest Johnnie Walker campaign in Lebanon? I am sure you all did, at least on Facebook. A great example of how a brand can produce content and go completely viral. Lets have a quick review at the campaign created by Leo Burnett who once again marvels us with their great work. Today, (almost) all marketers (and therefore advertisers) are seeking to leverage and intensify the reach of their communications by creating ads that become viral even though the viral potential of a campaign is fairly rare. Actually, the thing that is great about this campaign is that it generates a great deal of emotions (the music is really great) and raises interest by touching a large audience. Architect Bernard Khoury clearly gives scope and carries the brand message. The campaign is integrated into many media a part from traditional TV/and press. The website is actually very well conceived since it delivers branded content from one part (videos telling the great stories of Bernard Khoury) and “social” functionalities from another (integration to Twitter and Facebook) to disseminate this content. 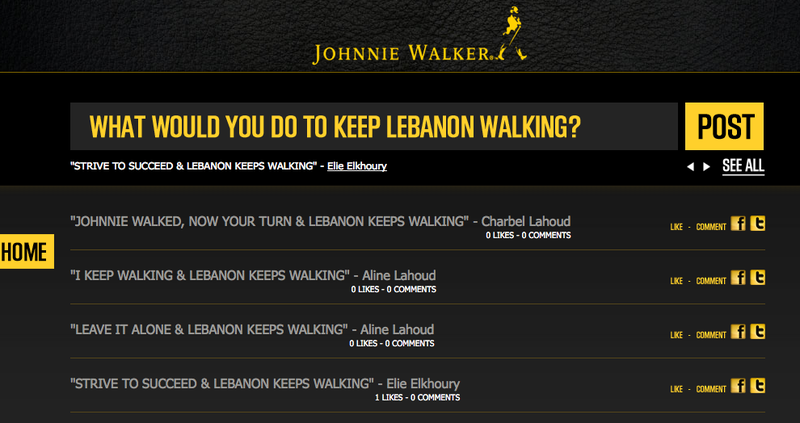 The campaign also calls upon user’s imagination in the creation of small sentences in order to “Keep Lebanon Walking”. The last (but not least) thing I would like to point out, is the fact that the concept, as amazing as it is, reminds me of the Journeys campaign launched by Louis Vuitton with ad agency Ogilvy Paris in 2007, one of the greatest campaigns in terms of branded content that simply tells the story and reveals the wonderful journeys of celebrities (such as Catherine Deneuve, André Agassi, Keith Richards and many others…) who made it out there with great achievements. This entry was posted in Advertising, Digital and Social Media, Marketing and tagged bernard khoury, johnnie walker, lebanon, leo burnett, social media, viral ads. Bookmark the permalink. We’re happy to inform you that your blog on Johnnie Walker is featured in our latest issue of Communicate Levant, now available on the market. Check it out and keep up the good work. Hi Leyla! Thank you for your interest in our blog! We’ll definetly check it out! 🙂 Cheers! It’s an old post but I’ve just come across it. 1- this ad was more of an Ad to Bernard Khoury than it was to Johnny Walker. i.e. Khoury was known in certain circles before the ad, now he’s a celebrity, whereas Harvey Keitel and Roberto Baggio were already celebrities when they shot the same Ad (different story of course). 2- Bernard Khoury’s Ad is definitely not viral, the best video had 2,800 views I hardly call that viral. Whereas the JW’s “The man who walked around the world Ad” has 1.3 MILLION views, now THAT is viral. The only viral effect I see is JW’s “global” campaign of success stories, not Bernard Khoury’s particular campaign. I too am a fan of LB’s work, this one however is more of an infotainment placed in the framework of an advertising campaign. I appreciated the info the campaign altogether (I didn’t know who Bernard Khoury was prior to this campaign) but I would hardly call it viral. Thanks for your answer and for sharing your personnal views on the subject. Just on precision though : viral does not inevitably mean that the campaign is “popular” and that it generated a high number of views.